Open to: students who wish to pursue their study in the first and/or in the second year of master in fundamental mathematics and theoretical computer science. 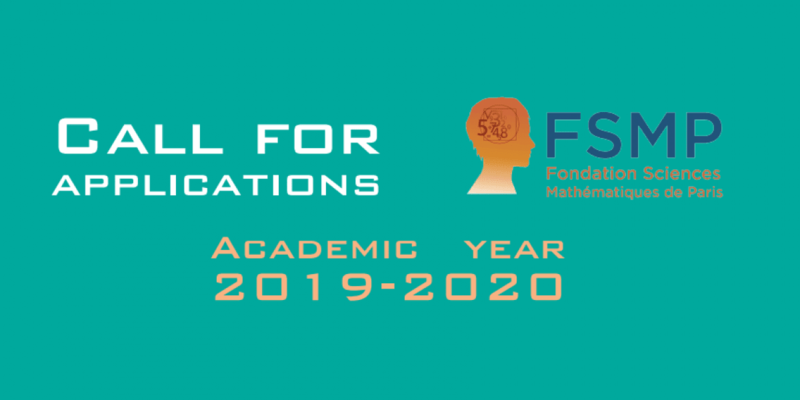 The Fondation Sciences Mathématiques de Paris offers to students, selected through an online application process, some scholarships of 1 or 2 years in one of the universities of its network. The laureates will be able to register to the universities of the FSMP network. They will benefit from a range of courses based on the skills of the whole parisian laboratories in mathematical sciences research. This program is supported in particular by the French Embassies in South Africa and Lesotho, Albania, Austria, Bolivia, Cameroon, Korea, Hungary, Iran, Iceland, Japan, Madagascar, Nigeria, Quebec, Romania and Togo. Ukraine, Sudan, Uruguay and Vietnam; as well as by Paris Sciences Lettres University (PSL), INRIA, and Paris 13 University (LAGA). The scholarship starts on September,1st 2019. It is mandatory for PGSM laureates to be in Paris on September 1st to benefit from intensive french courses and to complete the administrative procedures. This scholarship is available for students who wish to pursue their study in the first and/or in the second year of master in fundamental mathematics and theoretical computer science. Female student are particularly encouraged to apply. Moreover, during the second call, an additional M2 scholarship in Pure Mathematics, financed by IMJ-PRG, will be awarded to a female student who has completed her M1 in mathematics or prepared “agrégation de mathématiques” in Sorbonne University (Paris 6) or Paris Diderot University (Paris 7). Laureates for M2 studies will receive a scholarship for 10 months (+ 2 months if they want to do a doctorate in France). Laureates for M1 studies will receive a 12-month scholarship. The extension of the scholarship for a second year is subject to the successful completion of the fist year and the jury’s approval. Applications must be made online, here.